My TV or Freeview box will not find Gold or Smooth Extra using a loft mounted aerial. My kitchen radio will pick these up dependent on position. Unfortunately it is not currently possible to receive Gold or Smooth Extra with a Freeview television or Freeview box. Gold and Smooth Extra are broadcast using the DAB (Digital Audio Broadcasting) digital radio standard. Your kitchen radio will have a DAB tuner and be able to receive these stations. Digital televisions and Freeview receivers use a different standard, known as DVB-T (Digital Video Broadcasting – Terrestrial). As these standards are not compatible it isn’t possible to receive DAB stations with a Freeview box, or radio stations on digital terrestrial television with a DAB radio. Smooth Radio on Freeview and Smooth Extra on DAB digital radio broadcast the same programmes and music between 7pm and 10am. 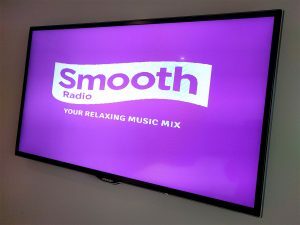 Between 10am and 7pm on weekdays Smooth Extra on DAB plays “Your Refreshing Music Mix” while Smooth Radio on Freeview has programmes from the national version of Smooth Radio. On weekends this applies between 10am and 6pm. Gold is broadcast in several parts of the UK on DAB digital radio, while Smooth Extra is available across the UK on DAB. Bude, North-East Cornwall (from Caradon Hill), Gulval, Helston, Newquay, Devon (from North Hessary Tor), Bodmin (from Penaligon Down), South-West Cornwall (from Redruth), St Austell, St Just, St Mawes and Truro. These transmitters also carry Pirate FM, Heart Cornwall, Gold, KISS, BBC Cornwall, Capital UK and My Music Radio. The availability of radio channels on DAB digital radio, Freeview, Freesat, Sky and other platforms is not consistent. Welcome to Digital Radio Choice - an independent buyer's guide for digital radios and devices. There's never been more to listen to on digital radio. We look for the very best digital radios and help you get the most from them. Good sound and a thoroughly functional design makes this a great buy for the kitchen or bathroom. Do you have questions about digital radio? Ask your question using the form and we'll post the answer on the Questions section. Will FM radio signals be switched off? What’s the difference between digital and internet radio? What are digital radio ensembles? Is there an ‘all-in-one’ radio with DAB, Bluetooth, FM and AM?